I have been a supporter of the so-called Tobin Tax for a number of years. In my former job I spent a wee bit of time promoting it. The proposal has been slightly tweaked and the campaign has been renamed The Robin Hood Tax. A very interesting brief video can be viewed here. The Robin Hood Tax is a tiny tax on bankers that would raise billions to tackle poverty and climate change, at home and abroad. By taking an average of 0.05% from speculative banking transactions, hundreds of billions of pounds would be raised every year. That’s easily enough to stop cuts in crucial public services in the UK, and to help fight global poverty and climate change. I think that this is an idea which is worthy of further consideration please take the time to look into it. 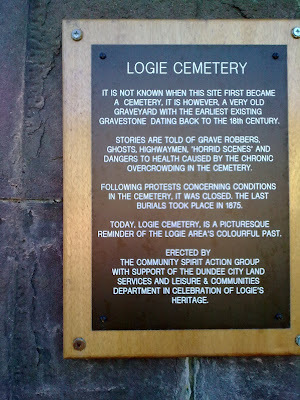 On Friday morning along with my three council colleagues and members of the Community Spirit Action Group I attended the unveiling of a plaque at the historic Logie Cemetery. The cemetery has a very interesting history and it is easy to pass it by and not give it a thought but it is well worth exploring. Some interesting information on the cemetery can be found here. It is important that we recognise that history is not just about kings and queens but about ordinary people and this cemetery allows us to view something of the history of our area. I would like to pay tribute to the work of the Community Spirit Action Group. They take very seriously promoting their local area and make a real contribution to the area. Well done to them. I hope that they go from strength to strength. 'Dundee's cuts total £5 million, but one £170,000 cut - from Dundee Employment and Aftercare Project (DEAP) - led to an unholy row between the SNP and opposition. A Labour amendment to restore part of the cash was declared incompetent by committee convener Councillor Willie Sawers, sparking fury among opposition councillors and the public gallery. Further fall-out about the budget process and the lack of transparency in the council chamber can be found in Friday's Evening Telegraph. This evening I attended a meeting of Community Spirit. This group works for the community in the northern part of the West End ward. The meeting heard a presentation on the work of SACRO in dealing with youth crime issues. We also heard about plans for a historical exhibition about this area. Issues that were raised by local people were graffiti, the state of roads and issues around recycling the area. This afternoon the SNP-led Administration forced its Budget through by hiding behind standing orders. Real people in Dundee will suffer as a result of this budget and the Administration showed contempt for the council. My colleague Bailie George Regan attempted to move an amendment which would have provided funding for DEAP (Dundee Employment and Aftercare Programme), he had asked for assistance in framing the amendment from the council's legal officers. Yet the chair of the meeting Bailie Willie Sawers ruled the amendment out of order, Bailie Sawers was then completely unable to explain his decision. This disgraceful decision demonstrated a lack of openness and transparency. "The scenes in the City Chambers today were shameful and reflect very poorly on the SNP Administration. Political parties in the City have a duty to put petty party politics behind them and work together in the best interests of the City. Bailie Sawers ruled Bailie Regan's amendment out of order and was then incapable of providing any valid reasons for doing so. The amendment had been scrutinised by the Depute Chief Executive (Support Services) and she was satisfied, prior to the meeting, that it was competent. I am seeking a meeting with the Depute Chief Executive (Support Services) to clarify what went on and seek an amicable and effective way forward in the best interests of the City. I will also be asking her about redress elsewhere such as the Standards Commission and Audit Scotland. I am appalled at the treatment which we were subjected to this afternoon. The handling of the meeting will damage the reputation of the Council. Bailie Regan's motion was attempting to restore funding to DEAP, the events today are an injustice to the workers at DEAP and their families and an injustice to the clients of DEAP who are looking for support to gain employment at this difficult time. Debate is being stifled in the City Chambers, no wonder Councillor Roberts recently said that there was no point in saying anything in the Chambers. There is a need for openness and transparency which was sadly lacking today. I am a politician and I can take the rough and tumble of political debate but today I really feel for the people associated with DEAP who saw their funding and their jobs disappear by means of political sleight of hand rather than in an open manner. These are real people with real problems who now face an uncertain future thanks to Bailie Sawers. The SNP Group Leader has said that jobs are his priority, today's meeting demonstrated that this was not the case." 'Free Nelson Mandela!' is a slogan I remember from my days as an undergraduate. It is remarkable, and makes me feel rather old, that today is the twentieth anniversary of the release of Nelson Mandela from prison. You can read about the anniversary of the BBC website. The Nelson Mandela Foundation also covers the story in detail. Some of my first political campaigns were around Mandela's imprisonment and once or twice I ventured to Glasgow to the South African consulate in what is now called Nelson Mandela Place to protest about his imprisonment. I also had the great honour to be in the same room as Mandela at a Labour Party conference, I didn't speak to him or even get particularly close to him but still it was a great honour. In Dundee it is important to remember that Nelson Mandela has the Freedom of the City. When this was awarded in the 1980s some people still said he was a terrorist or that awarding him the freedom of Dundee was a pointless gesture as he would never be released. I don't think awarding Nelson Mandela the freedom of Dundee brought down apartheid but it was part of an international campaign which did play a part in bringing down apartheid. Recently Dundee awarded the freedom of the city to Aung San Suu Kyi, we can only hope that a similar transformation is not too far away in Burma. I am a supporter of ACTSA (Action for Southern Africa) click on the picture of Nelson Mandela to visit their website and look at their work. Tonight I attended the monthly meeting of the West End Community Council tonight at Logie St John's (Cross) Church Hall. The main item of business was a presentation on the proposed Riverside Nature Park. This looks like a very exciting project and I hope that it will come to pass sooner rather than later. I would like to pay tribute to the local people who have pressed for this over many years. The meeting also allowed local people to make a number of interesting points about issues which concern them. I popped in to the police's West End Community Police Surgery. I was delighted to see a relatively good turnout. I think that this was an excellent initiative from the local police. All public bodies should listen to the views of local people and I was pleased to see the police do just that. The local police based at Ryehill Police Station do a good job and are always willing to listen to local people. If there are any issues which local people want to raise with them please speak to them or contact Tayside Police on 0300 111 2222 (999 in an emergency). I will be writing to the new Chief Constable Justine Curran welcoming this initiative and hoping that it will be continued. I will also be congratulating her on her recent appointment as Tayside's first female Chief Constable. The event is covered in Wednesday 10th February's Evening Telegraph. I urge people in the West End to take the opportunity to visit the police community surgery in the West End tonight. Tonight's surgery takes place at Blackness Library between 5.30 pm and 7pm. I would urge anyone with any concerns about policing or crime to take the opportunity to go along to the community surgery and tell the local police what they think. I think Tayside Police are to be commended for this initiative and it is important that local people raise their concerns with the police. As a local councillor I am also happy to take up any concerns people have about crime and the work of the police in the West End at any time. I think that people with concerns should use the opportunity given to them tonight. The City Council and its committees met this evening. There were a few interesting reports. At the Leisure, Arts and Communities Committee I spoke on Community Learning and Development, this is very important. I have been fortunate enough to have had the chance to visit many of these programmes. These programmes make a real contribution to the future of our city and the staff involved are to be commended. At the City Development Committee there was a report on new parking restrictions (in simple terms yellow lines) many of which will be in the West End. I would urge anyone with views on this to ensure that they make their voices heard during the forthcoming consultations. Also at the City Development Committee there was an interesting report on the prospects for rail freight. This is something which needs to be promoted more strongly and I believe we should be doing all we can to make more use of rail freight, I am also think that there is scope for more use of the port in Dundee as a means of transporting freight.